Primary Natural Resources timber, petroleum, nickel, cobalt, gold. OFF THE SOUTHEAST COAST of mainland Asia lies the Philippines, a southeast Asian country that consists of an archipelago in which there are over 7,100 islands and islets. Most of these islands are of volcanic origin. The latest massive volcanic eruption of Mt. Pinatubo in 1991 caused about 600 deaths, as well as flooding and mudflows. The north-south extent of the country is 16 degrees of latitude. 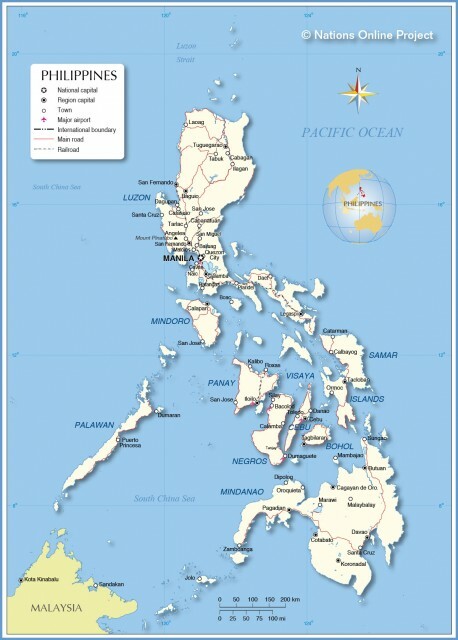 The two largest islands are LUZON in the north and MINDANAO in the south. They are separated by about 200 mi (322 km). In its tropical marine type of climate regime, temperature varies from 75 degrees F (30.8 degrees C) to 87 degrees F (35.7 degrees C). Average rainfall is 120 in (304 cm), with distinct regional variations. Dry areas are in northern Luzon, Cebu, southern Negros, and interior Mindanao, Sulu and Palawan islands. Historically, the Philippines was first inhabited by pygmy-like Negroids, followed by Mongoloids and Caucasian groups starting around 11,000 years ago. The largest migration wave was of the Malays (lowland Filipinos) starting from 300 B.C.E. After explorer Ferdinand MAGELLAN’s visit in 1521, Spanish colonization in the form of settlements began in 1565. The settlement of MANILA dates back to 1671. Spaniards successfully converted the natives to Catholicism. The UNITED STATES became the master of the Philippines in 1898 as a result of the Treaty of Paris. Japanese occupation during World War II of the Philippines (1941–45) was brutal, but soon after U.S. reoccupation in 1945, the country became independent in 1946. A democratic form of government was introduced and elections took place every four years. Ferdinand Marcos, first elected president in 1965, put an end to democracy in 1972 and declared martial law in the name of upholding law and order. Democracy came back to the country in 1986 after Marcos was removed from power and a new constitution was adopted. Elections occurred every six years since then. Political instability, combined with Muslim fundamentalist rebellion in Mindanao, which has been recently infested with al Qaeda influence, accentuates centrifugal (disintegrating) forces within the country. Economic growth since the 1970s has been erratic and lurching. Gross domestic product growth rate in 2002 was 4.6 percent. Forty percent of the country’s population lives below the poverty line. Of the total labor force, 40 percent are engaged in agriculture, 27 percent in services, and a mere 10 percent in manufacturing. Rice is the principal crop, followed by corn, sugar, and copra. Industries include pharmaceuticals, food processing, electronic assembly, petroleum refineries, textiles, and wood products. The Philippines is a Catholic country, a legacy of Spanish colonization; 83 percent of the population is Roman Catholic; 9 percent is Protestant, and 5 percent is Muslims, mostly on Mindanao. Because of strong religious beliefs held by Catholics and Muslims, family planning methods are resisted, which leads to a high fertility rate of 3.29 children born per reproductive-age woman (2003). The two official languages are Filipino and English.